OK, so it’s only going to be two ways at the moment. Tofu can be a contentious issue, some people love it, some people hate it. I’m in the tofu lovers camp, but I can understand why some people might not like it, after all it’s a lump of rubbery, white nothing … until you do something with it. Hopefully something good! Badly prepared tofu can be enough to put you off. The thing is, that tofu has no flavour as such, it’s a flavour carrier, so you have to give it flavour. Plus it’s so versatile. It can be cut into slabs marinated (that’s the most important bit) and grilled or fried for tofu burgers, cubed and added to curries (make sure it’s in there long enough to absorb the flavour), pureed to make batter for a quiche or frittata, crumbled for a scramble, used in a dessert, the list goes on. First I blended the tofu with the vegan honey (you could use agave, maple syrup or another sweetener – this was just what I had) until smooth. Then I melted the chocolate in the microwave. In our microwave it took about 1 min and 15 seconds – be careful here, you don’t want to put it in for too long. I added the melted chocolate to the tofu and mixed it in. It wasn’t looking very chocolatey and I didn’t have any more chocolate so I added cocoa powder to make it richer. I just kept adding until it I was happy with it, so 1/2 cup is a rough estimate, but just add it a bit at a time to suit your taste. I also added in about 1 tsp of cinnamon here. Then I put it all back in the blender until it was looking smooth and creamy again. The whole lot went into the fridge to thicken and give the flavours time to develop. This takes at least a couple of hours. I made it in the morning to have that night. 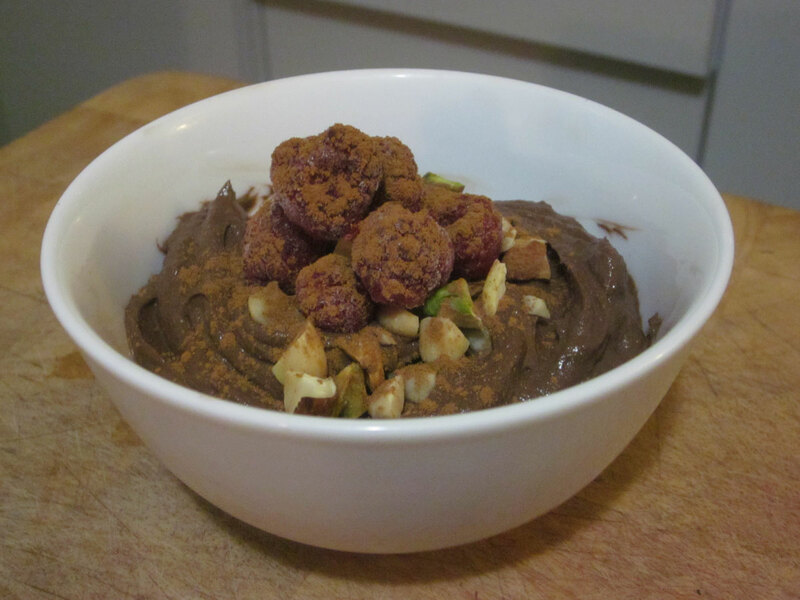 To serve I just put some in a small bowl and topped it with chopped nuts, raspberries and a sprinkle of cinnamon. It was really, really yummy. This made enough for about 4-6 serves. Really you can do whatever you like with it, eat it plain, swirl a fruity sauce through it, or even a white chocolate version of the pudding, your imagination is the limit. 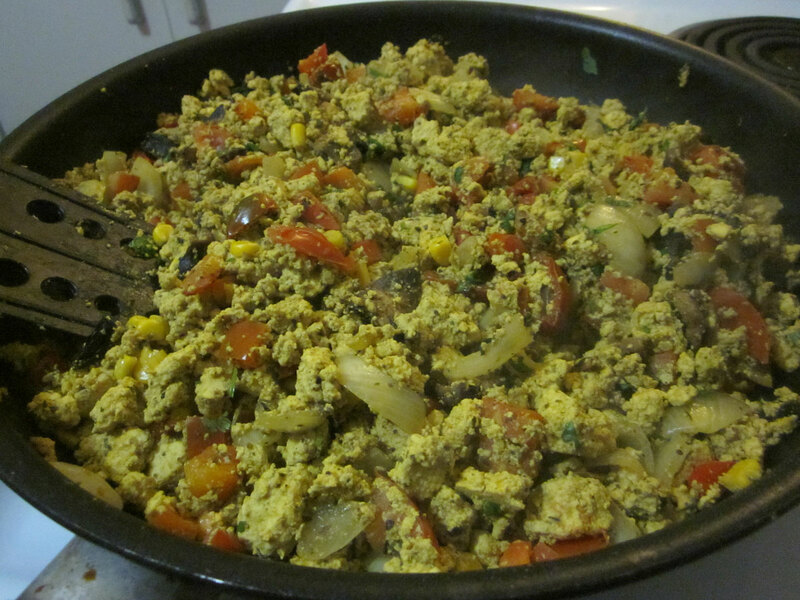 I’m a sucker for a tofu scramble any time of day. 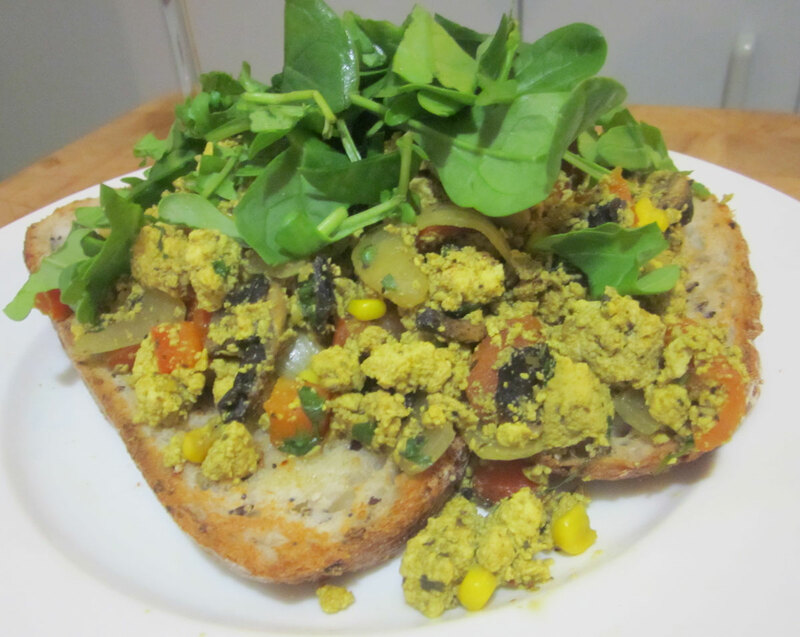 If there’s tofu scramble on the menu, then it’s a pretty good bet that’s what I’ll be ordering. You can make it with a firm silken or a hard tofu, but I prefer the hard tofu. You can add whatever flavours and veggies you prefer, so it need never taste the same twice. First, crumble the block of tofu into a bowl. Make the pieces as big or small as you like. Next, add the soy sauce and turmeric to the tofu and stir it through. I do this first so it has time to absorb some of the colour and flavour before it goes into the frypan. Heat up the frypan on the stove and add a little olive oil. Put in the onion and garlic and cook until the onion just starts to soften. Then add the capsicum, tomato, mushroom, tofu, dried herbs and savoury yeast. Cook until the veggies are fairly close to ready, and then add the corn kernels. When it’s all cooked add the lemon juice, fresh herbs and pepper. Mix it all together. Serve on some nice toasted sourdough, or whatever you prefer, and top with a handful of leafy greens (optional).